Methods Discussion: Although the "sage on the stage" idea we have previously discussed has lost some popularity, if you are a REALLY GOOD LECTURER, you can use the Lecture/Discussion method which is demonstrated with this brief piece on the Doctrine of Discovery. Lecture: At the beginning of the Crusades in 1095, Pope Urban II issued the Papal Bull Terra Nullius - a decree explaining the policy of the Catholic Church about empty land. This decree gave European kings the right to "discover" and claim land in non-Christian areas. In 1452, Pope Nicholas V extended this policy through the Papal Bill Romanus Pontifex that declared war against all non-Christians in the world and authorized the conquest of their nations and territories. A Papal Bull and a decree are the same things. What do you think they are? In year year 1095, where in the world would "empty land" be available? Would it really be empty? In your own words, what were the two Popes declaring in these Papal Bulls? First, Christians were the only civilized peoples and thus, they had the right to treat non-Christians as uncivilized and subhuman who had no rights to any land or nation. Second, Christians had a God-given right to "capture, vanquish, and subdue the saracens, pagans, and other enemies of Christ," to "put them into perpetual slavery," and "to take all their possessions and property." (http://ili.nativeweb.org/sdrm_art.html). 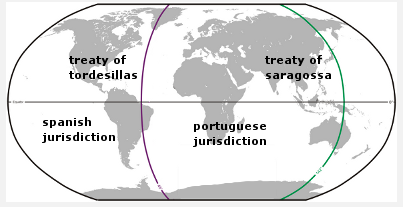 Thereafter, Portugal expanded its territory by making "discoveries" along the western coast of Africa and claiming those lands as Portuguese territory. 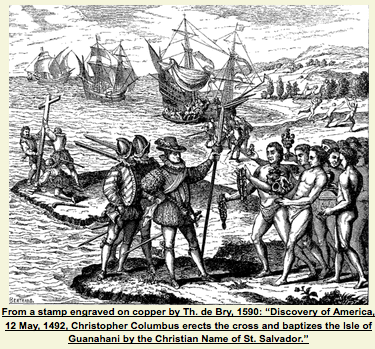 Thus, in 1492, when Columbus sailed to the "New World" he did so with the clear understanding that he was authorized to "take possession" of any lands he "discovered" that were "not under the dominion of any Christian rulers." When he returned to Spain, the Spanish Pope Alexander VI issued another Papal Bull on May 3, 1493, "granting" to Spain the right to conquer the lands which Columbus had already found, as well as any lands which Spain might "discover" in the future. Pope Alexander also stated his desire that the "discovered" people be "subjugated and brought to the faith itself." Given your understanding of these three Papal Bulls, what were the goals of the Doctrine of Discovery? Why would Spain and Portugal be so eager to subscribe to these Papal Bulls in the years between 1095 and 1493? When Portugal protested this Papal concession to Spain, Pope Alexander stipulated in another Papal Bull issued in 1493 that Spain could not establish control over lands which had already "come into the possession of any Christian lords." 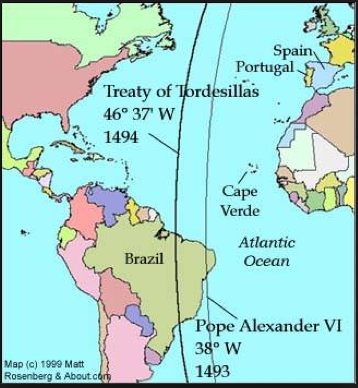 He then drew a line between the two poles, indicating that all lands discovered west of a meridian about 300 miles west of the Cape Verde Islands should belong to Spain and any new lands discovered east of that line would belong to Portugal. This papal bull also claimed that all lands already under the control of a "Christian prince" would remain under that same control. In essence, the Pope gave Spain the rights of conquest and dominion over one side of the globe, and Portugal over the other. Over 325 years later, the Doctrine of Discovery was infused into American law with the 1823 U.S. Supreme Court decision, Johnson v. McIntosh (8 Wheat., 543). Chief Justice John Marshall, writing for the unanimous Court, stated that Christian European nations had assumed "ultimate dominion" over the lands of America during the Age of Discovery, and that such "discovery" meant the North American Indians had lost "their rights to complete sovereignty, as independent nations," and only retained a right of "occupancy" in their lands. According to Marshall, when the United States became independent in 1776 it retained the British right of "discovery" and also acquired Britain's power of "dominion." How did the Doctrine of Discovery influence the way the United States was able to gain "dominion" over Indian Lands? How do you think Catholic doctrine became the way to take Indian land in a Protestant nation? European countries like Spain, Portugal, England, France, and Holland used the doctrine as a basis for colonization for over 500 years. And as we learned above, the doctrine was introduced to U.S. through its use in the Supreme Court case of Johnson v. M'Intosh in 1823, which in turn has been cited by courts in Australia, Canada and New Zealand. Along with the Episcopal Dioceses of Maine and Central New York and the Philadelphia Yearly Meeting of the Religious Society of Friends, many churches have denounced the doctrine in the United States and Canada. In 2011, several Unitarian Universalist churches and Quaker organizations also adopted resolutions to repudiate the doctrine. Methods Discussion: To give your students a more contemporary understanding of how churches have reacted to the Doctrine of Discovery in the 21st Century, you should read in full the WCC statement published in 2012 at http://www.oikoumene.org/en/resources/documents/executive-committee/2012-02/statement-on-the-doctrine-of-discovery-and-its-enduring-impact-on-indigenous-peoples. Because it is three pages long, this would be a good time to test your abridgement skills that we discussed earlier in the semester. (See "Teaching History 2016 at http://users.humboldt.edu/ogayle/hist420/TeachingHistory2016.html and scroll down to Goal #3 - see the section "abridging primary documents."). Once you abridge the document down to about 1 full page, then create either a DBQ or a Close Reading assignment.